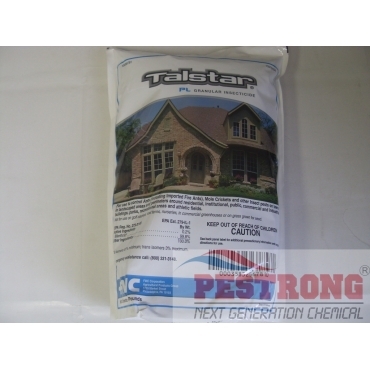 Where to Buy Talstar PL Granules, Talstar PL Granular Insecticide Bifenthrin - 25 Lbs - $34.92 for Sale with Fast Free Shipping! Talstar PL Granular Insecticide Bifenthrin - 25 Lbs comes a sand core granular formulation that’s ideal for long-lasting, broad spectrum perimeter control of ants, crane flies, fleas, ticks, chinch bugs and scorpions. Talstar PL granular insecticide penetrates mulch with no odor and no watering needed. This unique granule is heavy and virtually dust-free, so it won’t drift off target or wash away with irrigation or rainfall. Tested this out on one standing ant nest in the yard and within 30 mins. to an hour, I had ants stumbling out of their nest. At that point, this may actually work. Fast forward 3 weeks later, I haven't seen one ant in my house nor yard. Not even in the driveway. YAY!!! I've seeing too many scorpions in my house, so I asked my neighbor whom I play tennis with if he sees them in his house, and then he told me that he used to see some of them but then he used this talstar stuff and it's been while since he saw the last one, and so I looked it up, took me a little bit to find the right stuff but I found it, and it worked like magic!